Spread over an area of 65,000 sq. yards, the college campus is modern, attractive and well-equipped for comfort, convenience and academic pursuits. This campus offers a large number of special opportunities for students. Apart from the lecture rooms, it has fully furnished Computer Labs, Music Rooms, Home Science & Fashion Designing Laboratories, Design Labs, Science Labs, Geography, Travel Tourism and Psychology Labs, Studios for Fine Arts, Commercial Art, Photography and Design. Separate building of design has come up with Textile Lab, Fashion Lab, Interiors Lab, Studios, Shoppe, Dark Room, Video Production Studio, Audio Production Studio, Electronics Lab, Still Photography Lab & Studio, Art Galleries, Multimedia Lab, Jewellery Studio & Manufacturing Lab, Virtual Library, Seminar Room & Open Air Theatre, Hi-tech Language Lab & Aviation Lab & Aesthetically Designed Cosmetology Lab. The college is equipped with learning facilitators & gadgets ranging from Multimedia Projectors, Overhead Projectors, Slide Projectors, Xerox Machines, TV, DVD & Audio Players, Smart Boards and learning resources. In order to meet the demands of Computer & IT related courses, the college has a Techno Centre with eighteen state-of-the-art computer labs interconnected through Local Area Network with optical fibre backbone. The Network Resource Centre is equipped with Windows Servers, pfSense firewall/gateway/router, licensed software and a wide range of latest gadgets. The campus has around 400 terminals with Internet facility and latest printers, scanners, configurations to meet the needs of the students. The internet is available for 24 hours in all the labs and departments. The college offers Central Computing Facility to the faculty and the students to collect teaching learning resources. For conferencing, seminars, symposia & board meetings, the college has air-conditioned Seminar Rooms. The college offers HOSTEL accommodation to 500 students with all the ultra modern amenities, lush green lawns and a peaceful atmosphere, conducive for studies. The college offers a well-equipped multi storey high-tech, computerized and air-conditioned Library. Housed in an imposing, well-lit and ventilated building, it is the hub of activity all through the year. With 68,814 books, 153 national & international print journals, 132 magazines and 20 newspapers, the fully computerized library functions on open access system, augmented by reprographics facility. It has commodious reading rooms, exclusively for members of Scholars Club, for Honours and Postgraduate students and for the faculty. Every year the college spends lacs of rupees on books and journals, this being an area of top priority for the college. The college has access to 6000+ e-journals and 97,000+ e-books of various disciplines like Arts, Social Sciences, Life Sciences, Information Sciences, Literature etc. through N-LIST programme of UGC-INFONET. Each bonafide student is a member of the college library. Subsidized photostat service is available to the members of the staff and the students of the college. 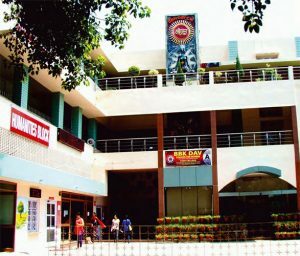 The silver jubilee AUDITORIUM – URVI, with a seating capacity of 1200 is the centre of academic, co-academic and cultural activities like conferences, orientation camps, face-to-face shows, annual functions. The SPORTS COMPLEX which is an impressive focal point of the players’ activities, has facilities such as a Badminton Hall, Yoga Hall, Table-Tennis Hall, Judo Hall, Gymnastics Hall, Weightlifting Hall, Counselling Room, Change Room for players, offices for teachers and coaches, Sports Store-Rooms and Exhibition Hall, NCC Room, NSS Room and others. In the beautifully designed Shri Mohan Lal Arora YAJYASHALA, Havan is performed daily at 08:30am, not only to purify the atmosphere but also to make the students aware of the Vedic Culture, our rich tradition and heritage. A multi-tiered parking block has also come up. The STADIUM with a seating capacity of 1,000 has also been constructed in addition to GYMNASIUM, MEDIA HOUSE, VIRTUAL LIBRARY, BIOINFORMATICS LAB and AVIATION LAB. A MULTI-ACTIVITY COMMON ROOM for students and a separate block for Music & Dance have been constructed. A separate block for the PG Department of Commerce has also come up. The Administrative Block of the college is refurbished and refurnished regularly to add to the impressive infrastructure of the college.